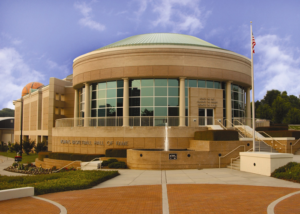 The Women’s Basketball Hall of Fame offers a unique venue to help make your event one to remember. We host a variety of events at the Hall of Fame including proms, corporate meetings, holiday parties, birthday and anniversary parties, family reunions, weddings, and much more. Information on each of our unique areas is listed below. All rentals include coordination of equipment rental through All Occasions Party Rentals and set-up and breakdown of event. A $150 cleaning fee will apply to all parties requiring significant setup, breakdown, and cleaning. Smaller events will be charged a $50 cleaning fee. 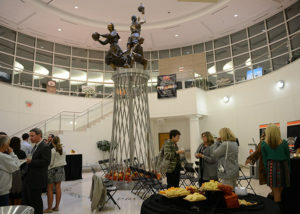 The Pat Summitt Rotunda area of the Hall of Fame features a sweeping staircase, panoramic views of downtown Knoxville, and a wraparound balcony. 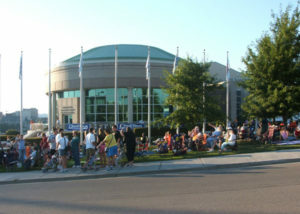 The Pat Summitt Rotunda can seat up to 250, with additional seating for 80 on the outside balcony. You may also rent the lower rotunda only, which can seat up to 100. The Urban Playground is a private area that is designed to resemble an urban ball court. 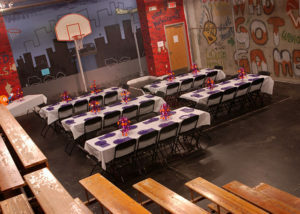 With graffiti covered walls, a chain link fence, and bleachers, the space is perfect for company picnics, team building, luncheons, and birthdays. The area can seat up to 100 at round tables and up to 250 with theatre style seating. 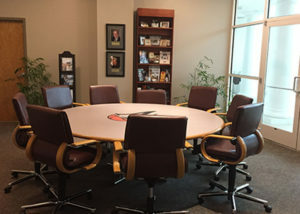 The boardroom offers a round conference table, dry-erase board, and seating for up to twelve people. A perfect space for small meetings or presentations. Want to make basketball part of your event? Our exclusive facility rental gives you access to the all areas above, plus our museum exhibits and ball courts. Your guests can relax as they shoot around on the court, learn about the past and present of women’s basketball, and take part in your special event. Up to 600 guests can be accommodated with this rental.